Incroyable. Five weeks here in Burgundy has flown by already. Tomorrow morning we leave our Maison des Chaumes to embark on the familiar trans-atlantic marathon in the direction of Victoria, Canada. The past five weeks have been a far cry from a “vacation” in the traditional sense of the word. It is dawning on us that managing four vacation rentals and one wine cellar is a lot of work no matter which way you cut it. For example, on vacation would you choose to spend your first two weeks camping day and night at the France Telecom office in Beaune trying to acquire functioning phone and Internet lines for four houses? Then would you spend the next two weeks dealing with the Préfecture de Police trying to jump through the administrative hula hoops to comply with a new law regarding a “taxe de séjour” applied to French vacation rentals? Eh non. And then there was the matter of La Clémentine. Two and a half is not a very relaxing age. At times adorable, certes, but not very relaxing. Add toilet training to the mix and a lot of the time I felt like I was living with an abusive sociopath. Toilet training is a Big Deal for many two year olds and at times Clem would be driven into such a frenzy of frustration and rage that she would would literally be throwing everything she could get her hands on and foaming at the mouth. Worse, she blamed it all on ME. I was hit, scratched, spat at, shouted at, and defied on a regular basis while Franck was out and about getting shouted at and defied by France Telecom and the Préfectures. The good news is that she has made some serious headway on the toilet training front and she has actually transformed into a French speaking bundle of cuddly joy this past week. 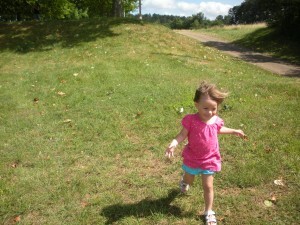 That is two year olds for you; the agony and the ecstasy. But in the midst of all this daily work and toilet training grind, there were many times where I was hit by a wave of joy and gratitude at having the chance to be able to come back here. 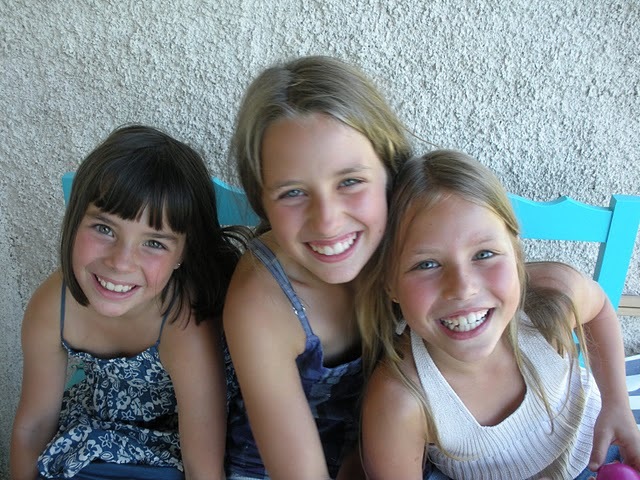 There were meals with our friends and family, endless summer evenings on our deck, playdates with French buddies, ice creams on Les Chaumes as the sun went down over the vineyards, The Crèpe Express, and even the occasional market visit. 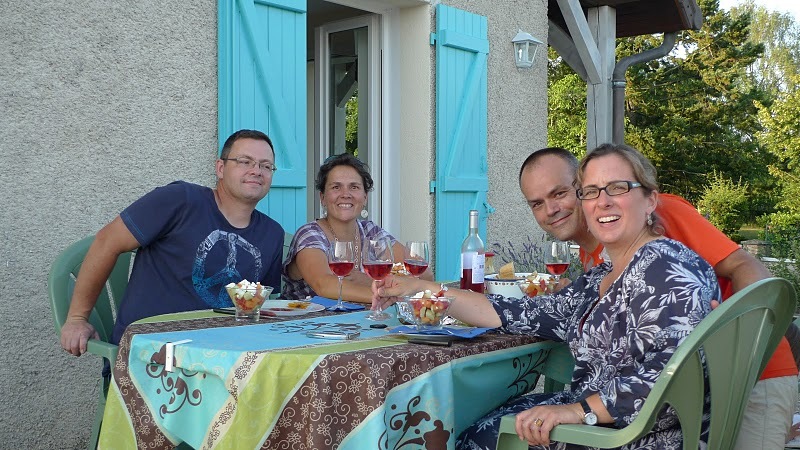 I think one of the best things about this trip was seeing how we all settled back into our French life and that French part of ourselves almost immediately. 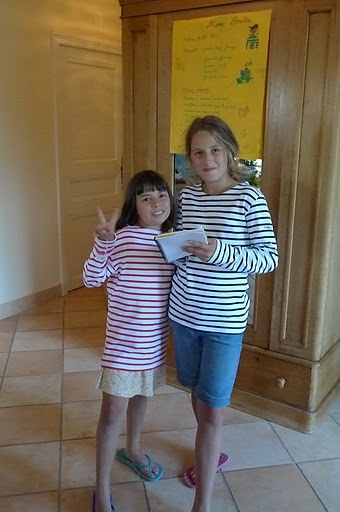 The girls had an amazing time reconnecting with all of the important French people in their lives and their love of the perfect baguette, running between the rows of vineyards, a ripe Epoisses, and family get togethers. They are as French as if they had never left. It brought me to tears on numerous occassions to think how wonderful it is that they already so fully possess two languages and cultures. So now we return to our other culture – the Canuck one. It is a bit daunting, knowing that this is going to be a wild and strange year. Starting (keeping fingers crossed) the week or two after we get back we will be demolishing and rebuilding on the lot we own in South Oak Bay right by the beach. This means we will be gypsies with no fixed address until we can move into our new place. We have found a rental until early January, and then will be couch surfing at my parents and perhaps other places until it is completed (we’re aiming for 9 months – just like a baby). Building a house is something I have always wanted to try but both the financial exposure and risks for delays, mistakes, and conflicts makes it a terrifying ride. Right now I feel as though I have been pulled to the top of one of those old fashioned roller coasters and the grip of the person holding on to the worn leather strap is loosening. It is thrilling, but it also makes me want to hurl. Luckily I have an amazing roller coaster maintenance staff in the form of our network of friends and family in Victoria. With them at my side, I am pretty confident that everything will ultimately turn out OK. So France, although it wasn’t what you’d really call a “vacation”, was definitely a much-needed change of scenery before what is surely going to be an eventful year. And luckily we arrive in Victoria on Monday evening and our dear friends Martial and Isabelle and their boys Arthur and Gabin from Burgundy arrive in BC on Friday evening to spend the month of August with us. That is one less tearful good-bye we will have to say, and a bit of France in Canada to enjoy for the next 30 days. De plus, during the past five weeks I have also stored up enough photos and material for at least a year’s worth of posts. Stay tuned…my goal for this next year is to try and enjoy the ride. 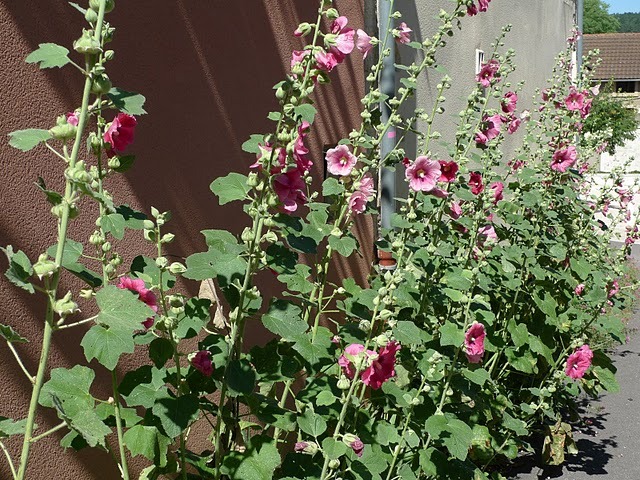 This entry was posted in Snapshots of French Life, Uncategorized on July 23, 2010 by admin. 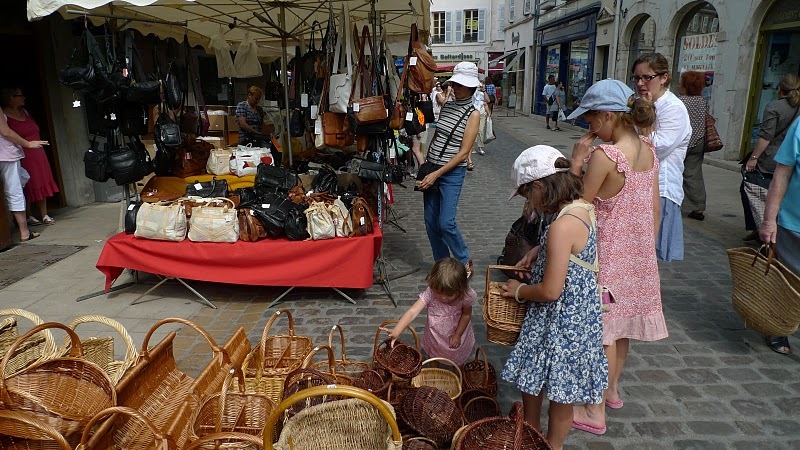 Franck and I made it to nearby Chalon-sur-Saone yesterday for a quick excursion to a few of our favorite “brocantes” to pick up some things for the gites. 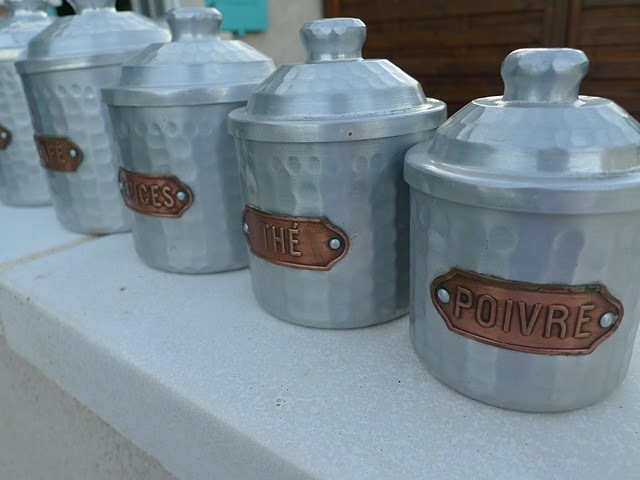 I wasn’t planning on buying anything for little old moi but when I stumbled upon this perfectly intact set of spice canisters for 25 Euros I couldn’t resist. Franck thinks they were manufactured just after the second world war using recycled warheads. They are amazingly light, and the brand name engraved on the bottom of each one is “Marmité” which literally means “bombed with missiles” in French (I looked it up). 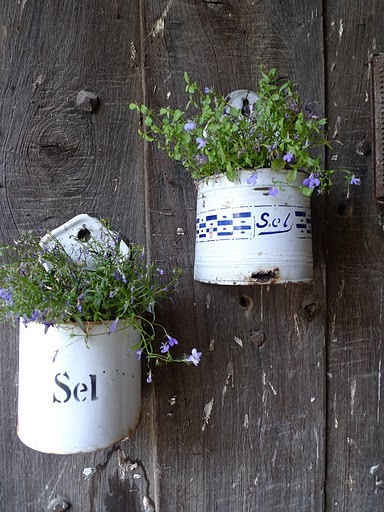 I like these so much I think I may be bringing them back to Victoria to put in my new house there – the house that actually isn’t built yet -but more on that later! This weekend we were priveleged to experience something really quite extraordinary, as well as extremely delicious. Remember Robert? This is the friend that Franck met while we were renovating Le Relais du Vieux Beaune while he was renovating Le Baron de la Doucette’sproperty across the street on the rue Rousseau Deslandes. One thing led to another (this happens a lot with Franck) and Robert ended up helping us for an entire year renovating our wine cellar in Beaune. 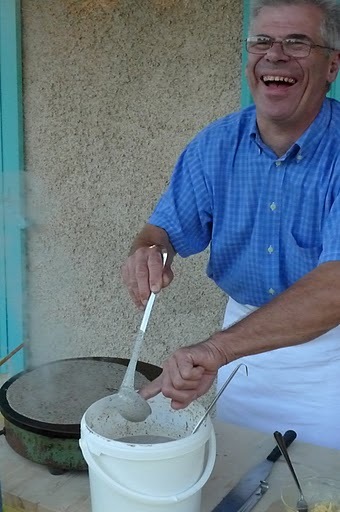 To thank him, we invited him and his wife Mireille to Canada this Spring, and while they were there they told us that they wanted to come down to Burgundy from Quimper, Brittany where they live to make us a feast of truly authentic Brittany crepes. Franck being Franck, he invited most of his family that weren’t on vacation (there were 18 or so of us). 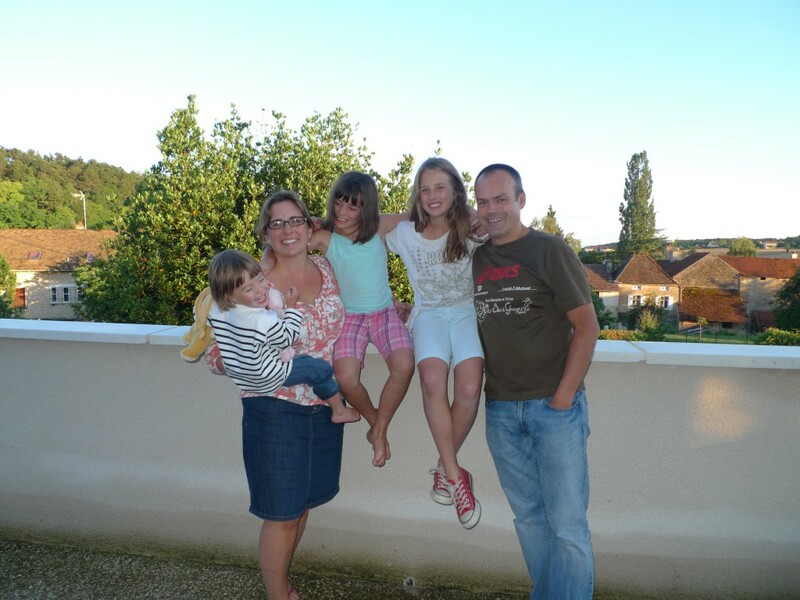 So Saturday morning Robert and Mireille set out from their house near Quimper with their car loaded to the gills with the crepe makers and all the ingredients they needed for the feats and drove SEVEN HOURS to us here in Villers-la-Faye. 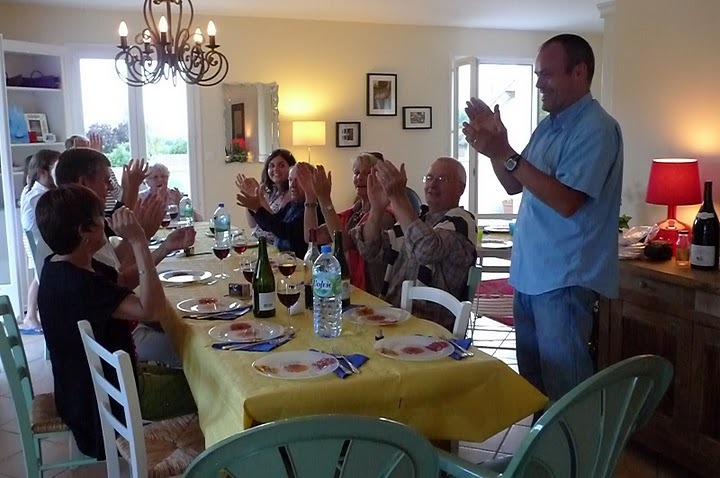 When they got here Mireille set right to work making her famous recipe for Black Wheat Crepes that are the traditional dish of Brittany while Robert set up the crepe makign station on out front porch here at La Maison des Chaumes. Around 5:00pm Franck’s family started to arrive, and we drank Champagne and “kir breton” (cassis and cider that Robert and Mireille had brought especially from Brittany) and then at around 7:00pm Robert and Mireille set to work and proved themselves to be the most amazing crepe makers I have ever had the privilege of coming across. Robert made crepes that were as fine and as beautiful as a piece of lace. There was a constant stream of spectators in front of the crepe station all evening – asking for tips, watching in amazement, and making sure their order was being executed! Mireille organized Charlotte and Camille into being the waitresses for the evening, a job that they pulled of with considerable charm and aplomb. As you can see, Mireille even bought them (as well as Clem and I) beautiful Amor Lux “marienieres” from Brittany so that we were dressed appropriately for the occassion. 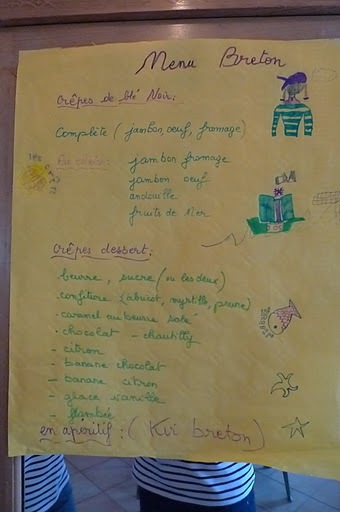 She and Camille designed a “Menu Breton” for the famished masses to choose from. 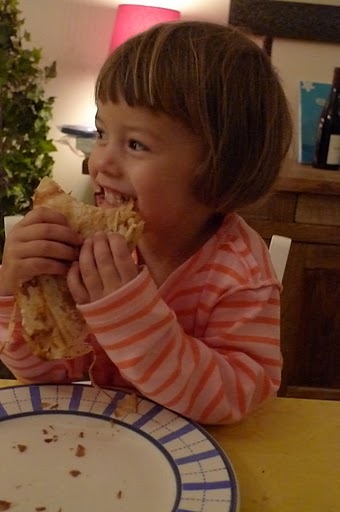 And as for Clem, I think she must have some Breton blood running through her veins. This entry was posted in Uncategorized on July 20, 2010 by admin. This entry was posted in Uncategorized on July 16, 2010 by admin. 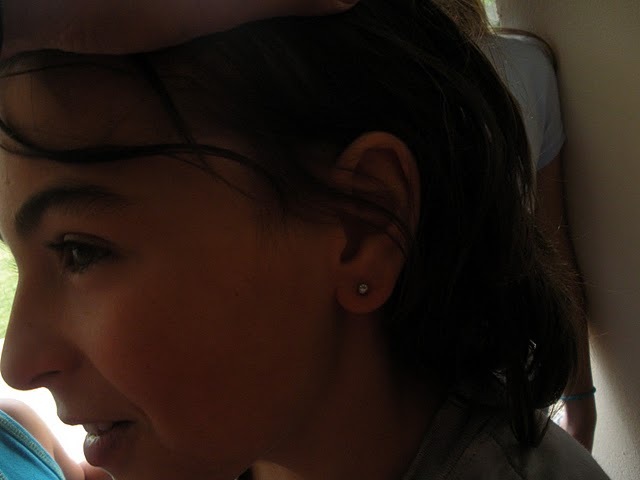 My sister-in-law Stephanie had always promised my girls that when the day came that they felt ready to get their ears pierced, she would take them to do it as her treat. 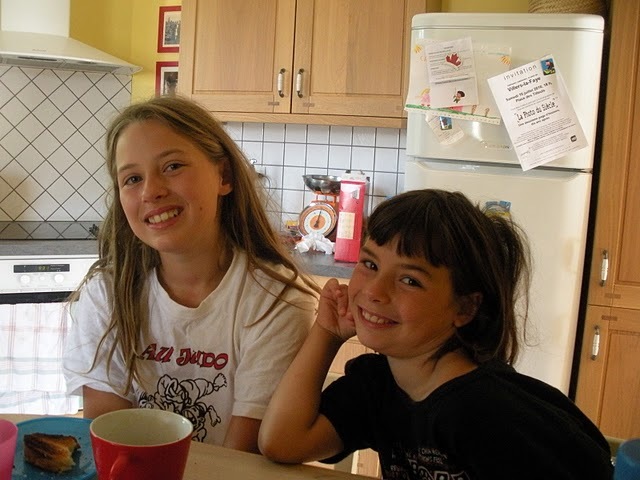 The girls were sorely tempted, so of course Franck (who sported a golden pirate’s hoop when I first met him) regaled Charlotte and Camille with tales of the horror and blood-baths involved in ear piercing. Needless to say, I wasn’t too worried that Charlotte and Camille would feel ready any time soon. This all changed, however, when last week their Ta Ta Steph told them that she was in possession of a magic ointment (Emla) that she uses at her job as an ER nurse in Beaune that she could put on their earlobes so that they WOULDN’T FEEL A THING. Girded with this knowledge, even Franck’s tales couldn’t disuade them. 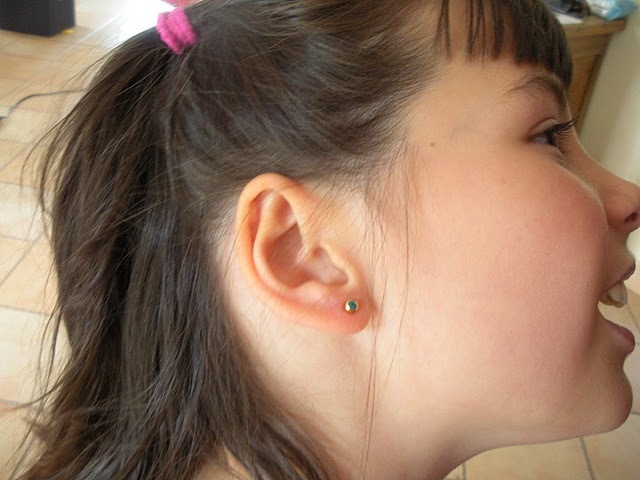 Their cousin Tom also decided to get his ear pierced like all the men on the Germain side of the family, so Stephanie hauled the four of them (Lola had her ears pierced when she was about four – before the halycon days of the magic ointment – so she just came along to watch the spectacle) to Beaune this morning. I wasn’t too worried that Charlotte would chicken out. She has proved herself on several occasions – notably some episodes of truly gnarly dental work – to be far more courageous than her mother. Camille, on the other hand, tried to make a break for the parking lot during her last set of shots here in France. Our lovely country doctor – Docteur Durand – and I both ended up in a serious sweat after chasing her down and then restraining her while she hollered and flailed as though we were going to cut off her right arm without anesthetic rather than administer her MMR booster. 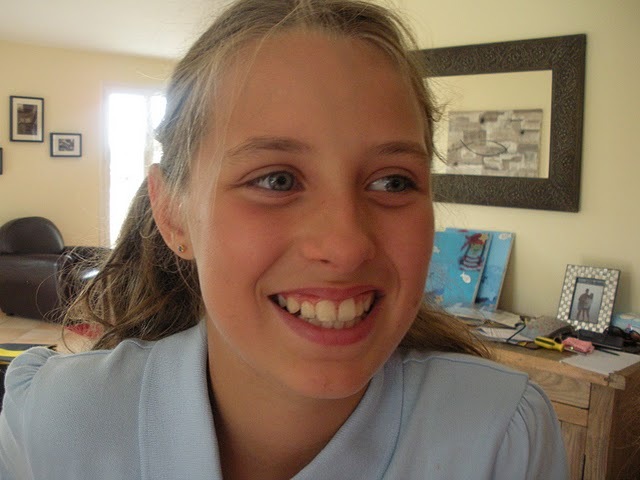 So I wasn’t at all sure when Steph left with the gang of them that Camille would actually come back with her ears pierced…but just look at the photos below. It’s nice to know that our children prove us wrong pretty much every day. This first photo will now gow down in history as the last one ever taken with unpierced earlobes! And now look! Tom was the first one in the door. Last night we bid good-bye to our dear friends Charlotte and Marco for another 11 months. We have had lots of laughs and great moments over the past three weeks, but somehow it just never seems long enough. To all you scientists out there – the universe needs a “Beam Me Up” machine as in Star Trek so that we could wake up in Canada and then go to dinner in Burgundy, and then be back in time for the girls to go to school the next day. Despite the VERY warm evening (it was around 37 degrees yesterday) we had a lovely dinner. Unfortunately, however, Clem had passed her stomach flu on to me and I sprang up at 2:00am to adopt a prayer position in front of the toilet and revisted the entire thing – course by course. And no, stomach flu is definitely no more glamourous or enjoyable in France, although I did have the opportinity to appreciate the lovely portuguese tiles in our newly renovated bathroom at La Maison des Chaumes.